Fat Sam NEIPA home brew is named for aforementioned character, Fat Sam, from the movie Fletch. The days that Chevy Chase was putting out great movies was short lived but they were nonetheless awesome. While watching Fletch, Fat Sam kept popping up in the front of my head. George Wendt always poses as a lovable role character in the movies and on television. It was time for Fletch to rightly honored: Fat Sam. Continuing the quest for another NEIPA, I had decided that having high amounts of wheat and oats hadn’t been something that I brewed. I also hadn’t brewed a NEIPA with copious amounts of Mosiac and Citra. It seems that most of the “great” ones use one or the other or both. The Rakau was remnants sitting around from an earlier brew day. Enjoy! 2017-11-11 (morning): @69.8*F, hard fermentation. 2017-11-12 (evening): @67.1*F, slowing fermentation, added dry hops: 2.0 ounces 2015 Rakau, 1.5 ounces 2016 Mosiac, 2.0 ounces 2015 Citra. Placed on heat @70.0*F.
2017-11-17 (evening): Put on temperature control at 37.0*F.
2017-11-19: Bottled with 3.50 ounces of priming sugar and 2.0 cups of water. 24, 22 ounce bottles. Bottle crown label: FS. 2017-12-03: Drinking great. Might easily be the best NEIPA I have made to date. Need to do a tasting write up. Useless Fact: Warren Buffet filed his first tax return at age 13 to report income from his paper route, and claimed a $35 deduction for use of his bicycle. 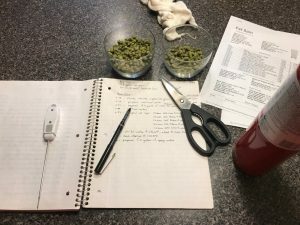 This entry was posted on Thursday, November 9th, 2017 at 12:59 pm	and is filed under Beer Recipes, Home Brewing. You can follow any responses to this entry through the RSS 2.0 feed. Both comments and pings are currently closed.